Filmmakers and scriptwriters talk endlessly about how tough it is to dramatise the creative process. What do you do? Have a painter look at a sunset or a beautiful woman or a train entering a station and pick up a brush and muse a bit and then start to paint? Hmm…sounds exciting. You think that’s tough? How about creating a drama about a writer—cue to: man or woman staring at a typewriter or computer screen for hours—or, get this, a blacklisted scripter who can’t get anything published? That’s the problem director Jay Roach and scriptwriter John McNamara confronted when dealing with the strange tale of Dalton Trumbo. A bespectacled writer with a jaunty mustache and a beautiful wife, the real Dalton Trumbo was the most famous member of the Hollywood Ten, a group of radicals who took the First Amendment against the House Un-American Activities committee in 1947 and served one year terms in prison for refusing to answer to whether they were members of the Communist Party. I know what you’re thinking: so this story involves history about a bunch of writers who were radicals more than 60 years ago? Yep. That’s right. Not blockbuster material but you might be intrigued by the story. After Trumbo and his friends were released from prison, no one would hire them. They were blacklisted—and in the resulting hysteria which is now referred to as the “McCarthy era” (named after a US Senator who made a name for himself insisting that the American federal government was riddled with “Reds”), thousands of people lost their jobs in the entertainment industry, the government, schools, hospitals and, well, before it was over, nearly everywhere. Many people fought the blacklist but it was one man who broke it—and just at the right time, when John Kennedy became President, ushering in a new era of liberalism in 1960. 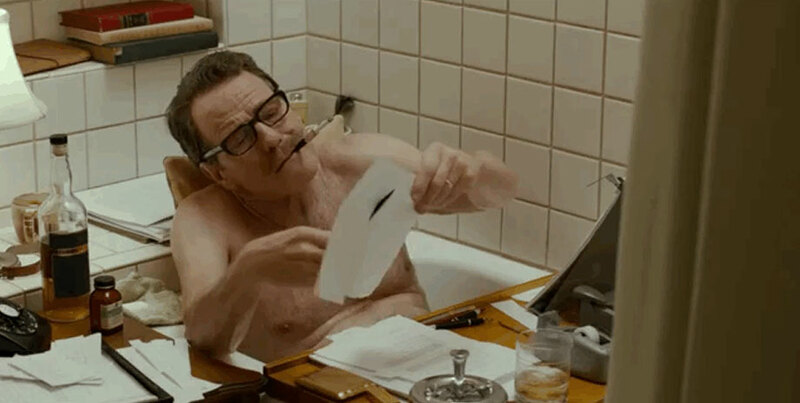 That man was Dalton Trumbo: the guy with the mustache, the beautiful wife and an amazing ability to churn out scripts on the cheap for nearly a decade until he rendered the blacklist absurd. 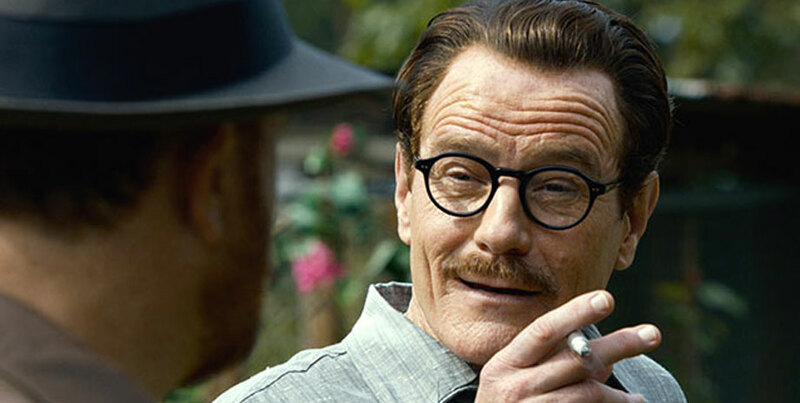 In Trumbo, Bryan Cranston is sensational in the titular role of the man who emerged from prison, and after a couple of years in Mexico, decided to break the blacklist. Aided by his wife, Cleo (Diane Lane is cast perfectly), a group of blacklisted but less famous writers (Louis C.K. is a stand-in for them all) and a “B” movie producer Frank King (John Goodman), who was happy to underpay the hugely gifted Trumbo and his friends to write scripts for peanuts, it became an open secret that some of the best films being made in Hollywood were actually being written by blacklisted radicals (and former radicals who refused to be dishonoured by revealing the names of old leftist friends). 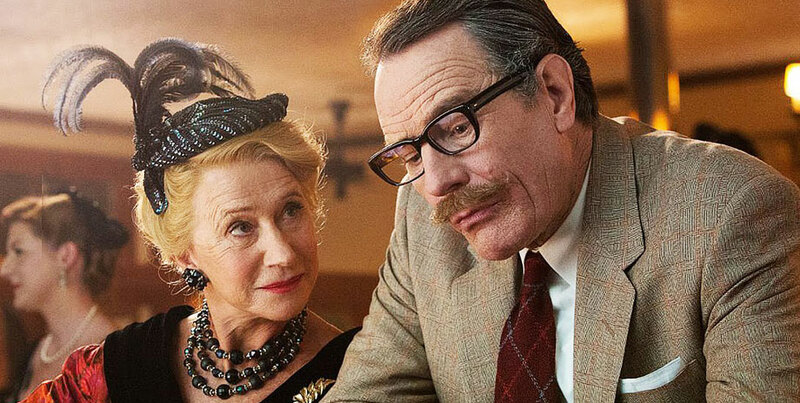 Eventually, Trumbo was offered a couple of plum assignments, writing the scripts for Spartacus and Exodus. When Otto Preminger offered to put his name on Exodus, Kirk Douglas followed suit for Spartacus and the blacklist was broken. It’s a great story for nerds like me who love history and politics and ethics and writing. Heck, I’ve even read the Bruce Cook bio, which is the basis of this film. Will Trumbo be a big success? I doubt it. But if you like writers and a nice yarn about the little guy socking the Establishment in the eye, this is a good film for you.